Having yet to be officially confirmed as a new Ac Milan player, Antonio Cassano, has already brought good vibes to his new club as his new teammates were already impressed with the works his doing at the Rossoneri’s current training camp in Dubai. Cassano, who is being allowed to train with the fashion capital side before finalizing his move in January, has shown positive attitude despite haven’t really been in a good physical shape due to his long lay off at Sampdoria. The trequartista reportedly scored a goal in a friendly practice game between Milan players with an assist from Zlatan Ibrahimovic, who was reported as the first person to groom and greet Cassano on the plane before the club fly to Dubai. Although the soon to be ex-Sampdoria player has only trained for a very short period, the Rossoneri stars such as Ibra, Pato, Seedorf have already felt the willingness of the Italian international to prove his worth at his future new club. 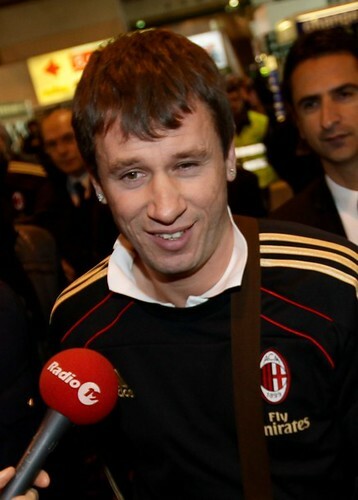 “We are happy that Cassano is here with us, He is a lovely lad and a great player. I think he can give us a big hand and help the whole team to win,” Pato said about his new teammate. Cassano is a good lad who has certainly found a squad that gives him the opportunity to shine in this new adventure,” “I must say in the two days he has been with us, Cassano has shown he wants to work and that is the key to everything. If this becomes the norm for him, then he can have an important future here at Milan,” Seedorf stated. More than support from several of his teammates, Cassano also gets a nice motivational pushed from s several coaches such as Fabio Capello, Massimiliano Allegri and Cesare Prandello, who believes that the Italian international would do well in Milan. Those coaches are certain that this could very well be the former As Roma player’s last shot at making something important at a big club after wasting his previous careers at the likes of Real Madrid. Surely it’s still very early to predict what will happen with Cassano in his new journey in the Red and Black squad, one thing for sure is the Rossoneri are well known for their hospitality in treating their players. The unique environment has pretty much helped lots of stars settling in well at the club, in the end everything will go down on how hard does the talented attacker would want to work for his new club, if he can give his all maybe he can finally fulfilled his along waited potential to really become more than a very talented Italian player. There are several doubts regarding Cassano’s odd temper that could burst occasionally, although he did managed it pretty well recently at Sampdoria before he finally got into a dispute with the Blucerchiati’s president, Ricardo Garrone, which pretty much caused his move to Milan in January. This latest issues somehow once again opens up the discussion would he settled with the new Rossoneri’s star studded line up which already consist of renown “troubled” egos such as Ibrahimovic and Robino. This questions can only be answered in the future especially when the player starts to make his mark as an official red and black players. One thing for sure, Cassano’s arrival will definitely bring another new enthusiasm at Milan as they already started to show real spark this season with Ibrahimovic and Robinho’s arrival. Should things work out well for the Rossoneri, Milanisti might be witnessing one of the most mouth watering attacking display from their favorite team at least in the league as there seems to be a confusing details about the Italian international availability in the Champions League. With a great environment, friends that he already knew, this surely will be Cassano’s last chance in proving that he can finally live up to his potential and producing something in the bigger stage. Milan are a very friendly neighborhood for many football players, a place when everyone are being treated like family, there’s not likely many place that could really be the perfect place for a talented act such as Antonio Cassano to let out all of his unleashed potential while playing at Sampdoria.